Chamonix valley was going mad the last week! Perfect conditions on the north faces of the Argentière basin and almost every single extreme descent has been skied. Just to name a few, there was a rare repetition of Col Armand Charlet (3rd time ever? 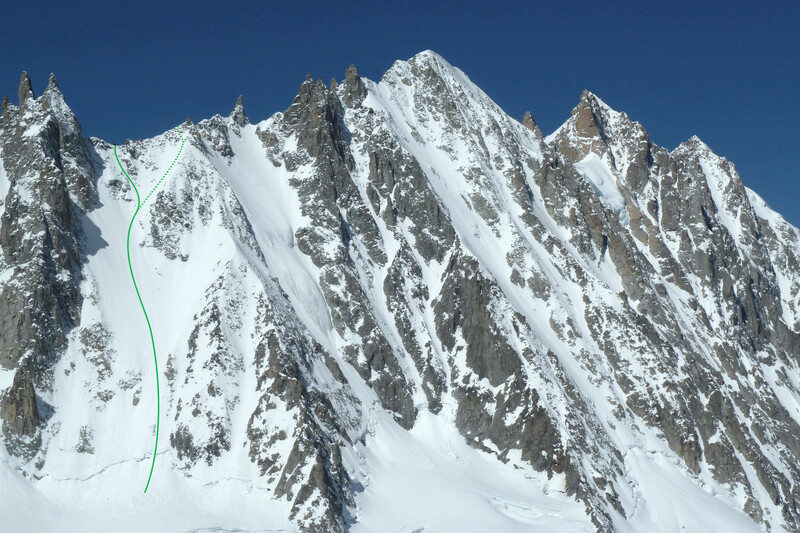 ), Col de l’Aiguille Verte has been skied minimum twice and the classic NNE face of Les Courtes looked like a piste. Luckily I ran into this small group of UK/US guys who agreed to ski it together with me. I was a bit late that day but they waited for me at the top of the Col. Super thankful! Our direct variation was probably a bit steeper than the given 5.1 but soft snow made it relatively easy to ski straight off the Col. A party of two had skied in front of us and from our group of four I was the last to set off. That meant high concentration from start until we hit the normal route. Here the snow had a little crust due to its more eastern aspect but the slope is wider and turns are made easier. From there on and a traverse to the far eastern part of the face we had great powder first, then good spring snow further down. All in all it was a nice ski day but quite busy later the day. A large group of skiers/snowboarders followed us 1h+ behind and turned around in the middle of the face. After the dogleg where we took shelter: Not as steep as the top, but still a little scary. Posted in Mountaineering, SkiingTagged Alps, Argentiere, Argentiere Basin, Argentiere Becken, Big Mountain, Chamonix, Chamonix Mont-Blanc, Col des Cristaux, Firntour, Frühjahrskitour, Freeride, Freetouring, Grands Montets, Les Courtes, Mont blanc, Schitour, Ski Mountaineering, Ski touring, Skibergsteigen, Skiing, Skitour, Steep skiing, steepskiing, Steilwand, SteilwandskifahrenBookmark the permalink.